The Great Wagon Road was the most important frontier road in the state's western Piedmont during the eighteenth century. Sometimes called the "Great Philadelphia Wagon Road," it began in Philadelphia, crossed westward to Gettysburg, turned south to Hagerstown, Md., continued south to Winchester, Va., through the Shenandoah Valley to Roanoke, and on to the North Carolina border. There it entered present-day northeastern Stokes County and passed through Walnut Cove, Germanton, Winston-Salem, Salisbury, and Charlotte before continuing into South Carolina and Georgia. The route that became the Great Wagon Road was originally a Native American hunting, trade, and war trail called the "Warrior's Path." In the mid-1700s European colonists, many arriving from ships in or near Philadelphia, began traveling south along the trail in search of land for new homes. At first the road was so narrow and rough that only travelers on horseback could use it; the farther south it went (from Pennsylvania into the wilderness), the more impassable it became. But as the settlers made their way along the trail, they cut trees, found suitable fords across rivers, and worked around obstacles until wagons could pass. In time the Great Wagon Road improved, by colonial standards. From the 1750s the Great Wagon Road was critical to the development of North Carolina. Tens of thousands of German and Scotch-Irish immigrants entered the colony from the north along the road and settled in the western Piedmont. 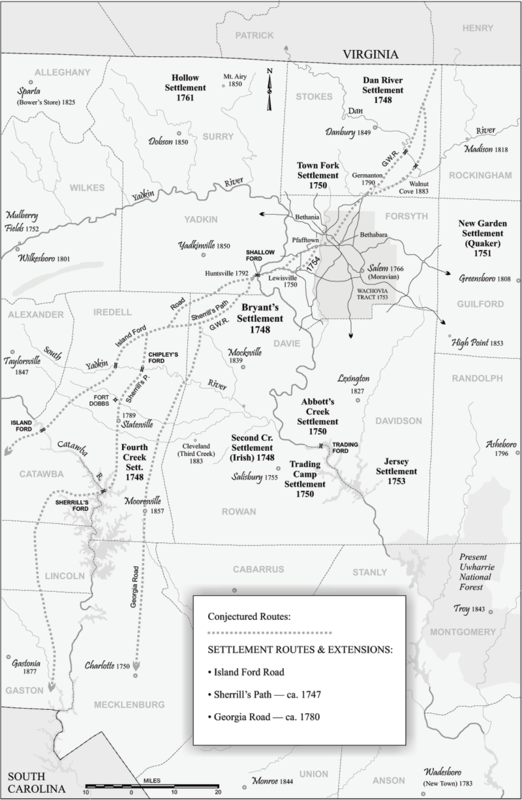 The Moravian settlements of Bethabara, Bethania, and Salem, as well as the cities of Salisbury and Charlotte, owe their creation and expansion to the Great Wagon Road. Important as a trade route, it provided a means for transporting frontier goods like deerskins to trade for salt, firearms, iron, and other items. Livestock such as hogs were herded down the road to markets in Virginia or South Carolina. In fact, the road was crucial to the survival of the western fringe of colonial settlement. During the Revolutionary War, the Great Wagon Road was the key supply line to the American resistance in the western areas of the colonies, especially in the South. For this reason Lord Charles Cornwallis led his English army from Charleston to the Great Wagon Road at Camden, S.C. His troops marched north along the road through Charlotte, and later through Salisbury and Salem, in an attempt to destroy Gen. Nathanael Greene's Continental Army and civilian support in North Carolina. Although unsuccessful in all these efforts, Cornwallis fully understood the importance of the Great Wagon Road during the Revolution. The road continued to play a significant economic role in North Carolina into the nineteenth century. With the expansion of railroads and the development of new roads in each community, however, it fell into disuse and in many areas disappeared. Much of the original route can still be found in Maryland and Virginia as State Highway 11, but there is no state or federal road that follows it in North Carolina. Parts of the old road can be found in heavily wooded tracts, and often local roads follow a brief stretch of the old route, but the cities that owe their existence to the Great Wagon Road have largely buried it through urban development. Forrest W. Clonts, "Travel and Transportation in Colonial North Carolina," NCHR 3 (January 1926). James M. Cooper, The Indian Trading Path and Great Wagon Road across North Carolina: Highlighting Rowan and Cabarrus Counties (1995). C. Christopher Crittenden, "Overland Travel and Transportation in North Carolina, 1763-1789," NCHR 8 (July 1931). Mobely, Joe A., editor. "The Great Wagon Road." The Way We Lived in North Carolina. Chapel Hill: University of North Carolina Press. 2003. http://www.waywelivednc.com/before-1770/wagon-road.htm (accessed June 15, 2012). Rouse, Parke. The Great Wagon Road: from Philadelphia to the South. New York: McGraw-Hill. 1973. Great Wagon Road map by Mark Anderson Moore, courtesy North Carolina Office of Archives and History, Raleigh. I was under the impression that the 1764-built portion of the GWR passed through Shallowford near Davie Co and then headed south east (a bypass of Indian settlement at Cooleemee) , making a crossing at Fourth Creek near Mt. Vernon Rd in Woodleaf (where portions are still visible), and headed toward Salisbury to the crossing at the Yadkin. I thought that Cornwallis took this route in his pursuit of Nathanial Greene. Is this correct? Thanks. Any ideas where were Boones Fo(a)rd and Dutchman's Creek Baptist Meeting House (organized 1772)? Henry Sheets in A History of Liberty Baptist Association21 says, "Daniel Boone's family were members of Boone's Ford Church, but Mr. Boone himself never joined the church, but his sympathies were with the Baptists." Boone's Ford Baptist Church was on the Yadkin River, in Boone Township, Davidson County, North Carolina. John Gano organized this church at the request of Charleston Baptist Association, in South Carolina and was its pastor from 1756 to 1760. "The Boone Family and Kentucky Baptists"
I was curious as to whether there is a more detailed map of the GWR’s path through mecklenburg co. I’d be particularly interested to see how its path overlays the modern landscape. Requesting permission to use the Great Wagon Road in North Carolina 1750-1780, by Mark Anderson Moore - our family is researching our Burns' family. Part of the family used this wagon road to migrate from Penn. to NC. We would like to include this map in our Burns' Family Story Research Project. The book will not be published and will only be available to the family. We appreciate your consideration of this request. I was wondering if George Washington traveled the Great Wagon Road going back home from his tour of the southern states. He visited Old Salem and then headed north back to Virginia and then home. Thank you for visiting NCpedia and for sharing this question. That’s a great question! Here is a link to a generalized map of George Washington’s trip from Mountain Vernon’s website: http://www.mountvernon.org/george-washington/the-first-president/map-of-.... It is very interesting to compare the western route of the trip which goes through Guilford Court House, Salem and Salisbury to the map of the Wagon Road. I suspect that some of the roads traveled may have been part of that system, but I cannot say for sure. I have included links to WorldCat for Bigham’s book and Rouse’s book. WorldCat searches libraries all over the world and you can see if a library near you has a particular book. Your local library may also be able to borrow a book for you from another library. I hope this helps. Please let me know if you have additional questions.